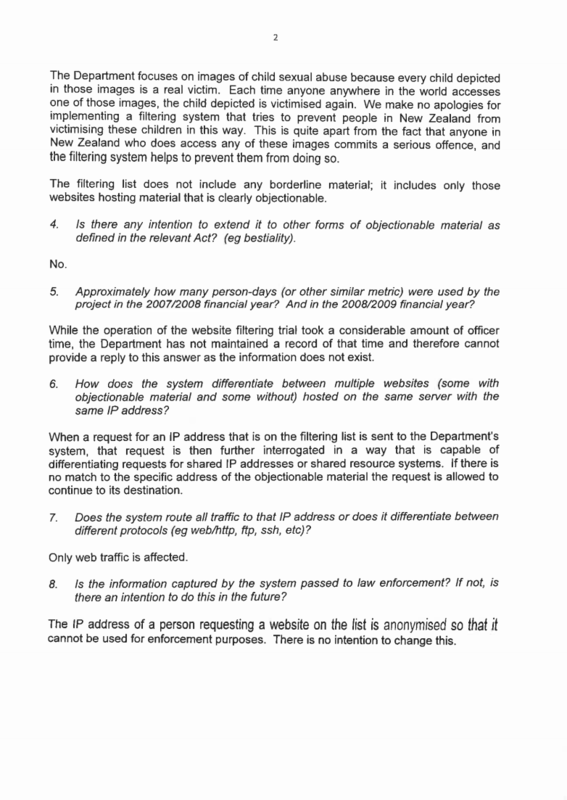 My second letter to the Department of Internal Affairs seemed to get lost so I sent them another copy. I just got the response (page 1, page 2, page 3). Unfortunately the letter is now a bit obsolete as I have found out all of the answers by other means. 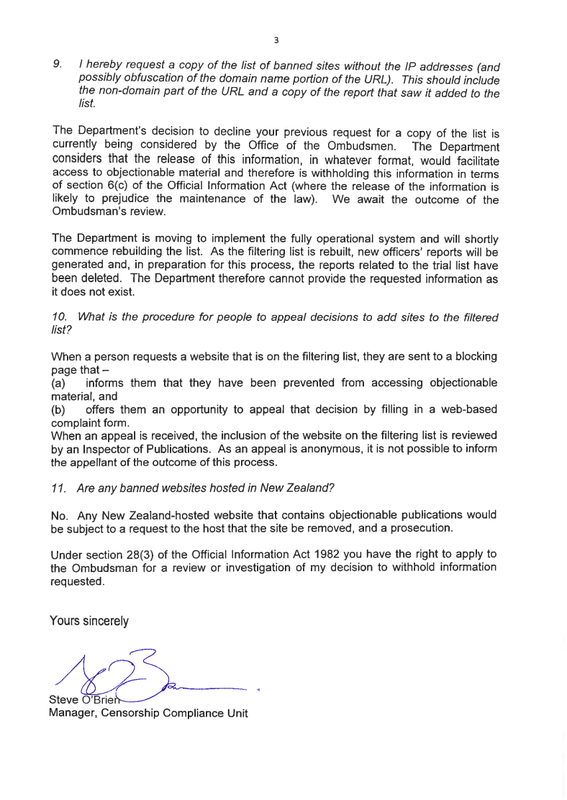 The Official Information Act is wonderful. It’s enabled me to request useful information from the DIA and expect to get it as of right. I’m impressed that the DIA have generally made a good job of answering my questions (although not always in the detail I’d like). Someone jokingly told me the other day that I’d better not want to leave the country (as the DIA administer our passport issuing system). It pleases me that a) that idea had never crossed my mind, b) that I can’t see that happening in New Zealand. Of course, it’s exactly this openness that I like that matters so much. 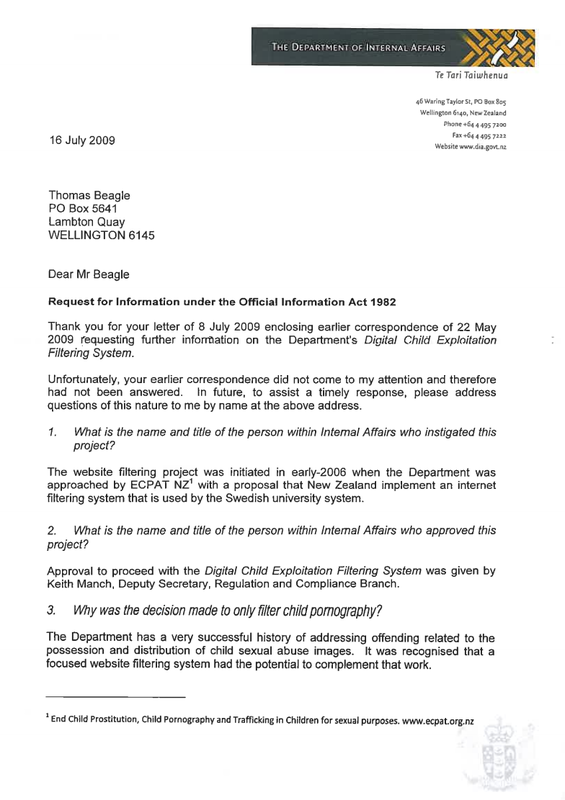 The OIA is good – but the secret censorship scheme takes away from that. We need accountability so that we don’t end up in the same situation as the Australians with their farcical scheme aimed at dentists and dog kennels. An open and democratic government needs to work in an open and democratic manner. Finally, I’d like to say that I support the DIA in their fight against child abuse and the people who make and traffic in images of child abuse. They have done some good work in catching people and bringing them to justice. Have you found out which ISPs are currently filtering using the DIA system?